Scientists are rushing to save Tasmanian kelp forests. A study from the Institute for Marine and Antarctic Studies (IMAS) has used kelp transplanted to artificial reefs to help explain why kelp ecosystems are being degraded around the world. The study found that adult kelp create favourable conditions for juvenile kelp by ‘engineering’ the environment to reduce water flow, sedimentation and light penetration. The researchers built an array of artificial reefs off Tasmania’s East Coast, where kelp forests have been impacted by climate change and invasive sea urchins, to test how adult kelp at different densities and patch sizes modified their physical environment and influenced juveniles. Lead author Dr Cayne Layton said the study found the ability of the most widespread and abundant kelp in Australia, Ecklonia radiata, to modify its environment depended on the size of kelp patches as well as their density. “Kelp are fundamental to the health of ecosystems around the world, creating complex physical habitats that support a vast range of marine life,” Dr Layton said. “However, increasingly kelp are being threatened by stressors such as ocean warming, urbanisation and pollution. “Unlike previous studies that have looked at the influence of these external factors, we wanted to understand how degradation affects the ability of kelp itself to engineer its environment and create a favourable habitat. 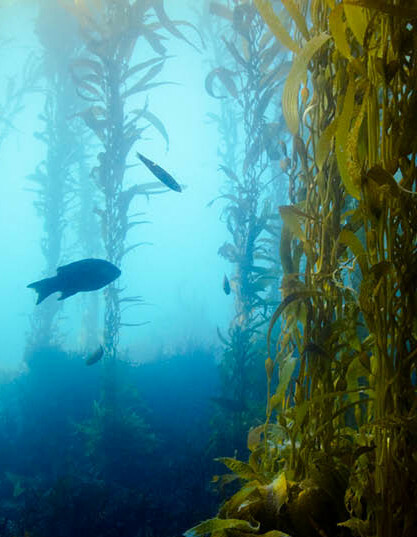 Dr Layton said the study found that kelp forest degradation has a significant impact on the organism’s ability to modify its environment to favour juvenile kelp. “We found that reducing the size and density of kelp patches impaired the recruitment and survival of the juvenile kelp. “With fewer juveniles to replace adults and repair damage to the patch, the resilience and stability of kelp forests was further eroded. “As previous research has identified, this downward spiral caused by the degradation of kelp patches can lead to a shift from these complex and highly diverse kelp forest ecosystems to habitats without kelp that that are simpler, less diverse and less productive,” Dr Layton said.